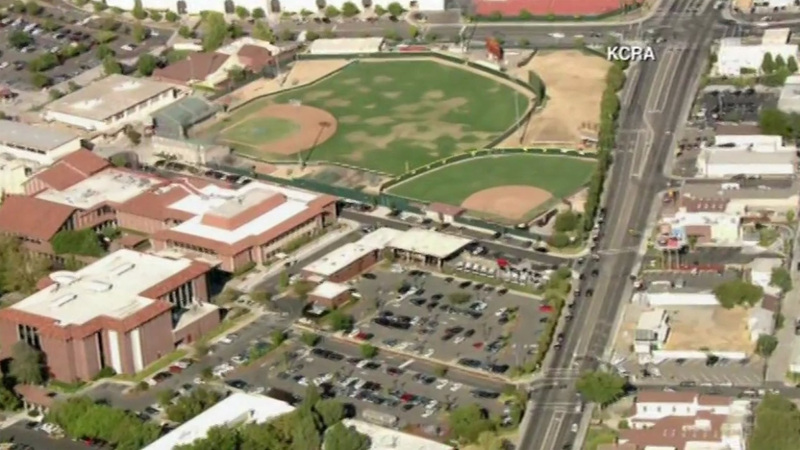 SACRAMENTO, Calif. -- A Sacramento community college reopened Friday as officers searched for a gunman who fatally shot one man and wounded two others in a parking lot at the edge of campus, officials said. Sacramento police Sgt. Doug Morse said the gunman ran away after the shooting near a campus baseball field Thursday afternoon and wasn't found in a sweep of the campus and surrounding neighborhood. The Sacramento County coroner's office said Friday that Roman P. Gonzalez, 25, died at the scene, according to The Sacramento Bee. Another victim was hospitalized and is expected to survive, authorities said, and a third was grazed by a bullet. Their names have not been released. All three were students at the school. The shooting began as an argument between two groups of men, said Dustin Poore of the Los Rios police, which patrols Sacramento City College. A physical fight escalated when a knife and gun were pulled out, said police in a news release late Thursday. Police said the shooting victim was believed to be involved in the fight. Detectives made an arrest on one of the subjects who was involved in the altercation. The man who sustained a minor wound, identified as Rico Ridgeway, has been charged with assault with a deadly weapon and placed on a parole hold in connection with this case. Ridgeway was booked into the Sacramento County Jail earlier this morning. Authorities have not ruled out gang involvement. It was also unclear whether the gunman has any ties to the school, and police have not given a motive. The gunman, wearing a white T-shirt and cargo shorts, remained at large Friday. The campus was locked down for about two hours Thursday before police officers had cleared all the buildings and allowed students and staff to leave, Morse said. Police descended on the campus shortly after the gunfire broke out, and students were told to stay in their classrooms and lock the doors. "My stomach dropped," student Lars Beesom told KCRA-TV. "It was definitely really, really scary, but we all stayed calm." Beesom added: "It's school. It's supposed to be a good environment, and you don't want to be scared here." Jackie Flores, 50, who lives across the street from the parking lot, said she heard four or five gunshots. "It all happened so fast," she told the Bee. Classes were in session at the two-year college in central Sacramento with a student body of about 25,000. The fall semester began Aug. 22. The corner of campus where the shooting occurred is surrounded by strip malls with chain restaurants on one side and a golf course on the other.